This simple security solution is well-featured and nicely priced, plus you can have it up and running in minutes. Image quality is limited to 720p, but with 1TB of storage and waterproof cameras included, it’s all you need to watch your property inside and out. This box of surveillance tricks from Trendnet includes everything you need to set up a multi-room security system that’ll cover the inside and outside of your office. Ethernet cabling, fixing screws, a mouse and two network cameras are all included, and you can add two more cameras to the four-way NVR (network video recorder) when you’re ready to upgrade. Thanks to the plug-and-play nature of PoE (Power over Ethernet), this one-box solution is fully operational as soon as you connect all of the cables. So all you need is a Wi-Fi network and a monitor to complete the installation and start your surveillance, recording in 720p resolution onto the 1TB hard drive. We should point out that the cameras are cabled, but you can monitor and manipulate the NVR wirelessly over the internet from your smartphone or computer. On the face of it, this product seems easy and inexpensive enough, but it’s not the most user-friendly solution around. 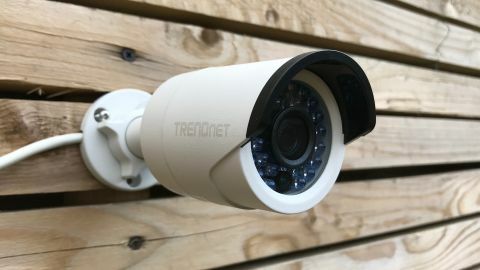 The average NVR surveillance system is rarely a thing of beauty, but Trendnet’s TV-NVR104K looks neat enough with its trim white casing and matching ice white cameras. The square-shaped NVR houses a 1TB SATA hard drive in a plastic unit small enough to fit on a shelf, or mount on the wall. Being a wired solution, there’s a fair amount of cabling attached to rear panel. The NVR has no LCD display of its own, so you need to connect it via HDMI (included) or VGA (not included) to a monitor to view its onscreen menu. A mouse is included to operate its interface. The two bundled bullet cameras are wrapped in a waterproof steel housing that feels robust enough to survive years of bad weather. Their metal ball and socket joints allow (stiff) movement and they are hollow to let the Ethernet cable pass through, and thus ensure they are fairly tamperproof too. A cluster of IR LEDs surround the 1.3MP camera lens, giving the cameras a clear view in darkness, and a motion sensor at the bottom means you can set up motion alerts and recording via the NVR. The TV-NVR104K offers a lot of security features for an all-in price of £300 (around $420 or AU$545). Four video channels is enough to cover most small to medium-sized business premises, and while there are only two cameras in the box, this leaves you free to choose from a very long list of ONVIF-compatible models from any brand. You might, for instance, prefer a couple of dome cameras for the other two locations. Because the bundled cameras are waterproof and capable of motion sensing and night vision, you can be quite flexible in how you choose to configure your system. You could set a schedule to record only at night, for example, or only when motion is detected, which will give you a lot more recording time. If you prefer to record everything, all the time, Trendnet says there is room for nine days of four-channel footage at 720p and medium VBR (variable bitrate). The cameras use 1.3MP sensors, which is a little limiting, and they cannot capture 1080p resolution. The NVR is also limited to 720p resolution, which will be enough for some, but it’ll look soft and disappointing on a 4K monitor. You can zoom in using the mouse, and set up areas of sensitivity, so that the camera only looks for motion within those zones. While the cameras do not have speakers or microphones, the NVR has a mono audio in and out channel if you want to connect your own. Using the mouse and on-screen menu, you can access the recordings via a calendar-style spreadsheet, which makes it easy to see which minutes actually contain video with motion. You can also access these recordings remotely via Trendnet’s companion app for Android and iOS, or a PC’s web browser. Thanks to PoE and with no Wi-Fi settings to worry about, setting up the TV-NVR104K from the box is very easy, and with all of the cables and mounting brackets included, installation takes just minutes. But having got set up, fine tuning your settings and preferences takes rather longer because the on-screen interface is rudimentary. All of your options are here, but the software is worlds away from the polished Nest and Netatmo menu systems. You navigate the convoluted menu system via a mouse, which you’ll also find in the box, and the first thing you have to do is set your eight-character password. We advise that the second thing you do is to locate the option within settings that disables it, because if you don’t, you’ll have to retype it every single time you play back a camera, or change a setting. Updating the firmware isn’t as simple as clicking ‘yes’. You have to download the ZIP file onto a USB stick via a computer and upload it. And if you want to access the NVR via your laptop, you can’t just log in to the Trendnet website and see it. Instead you have to port forward to the IP address of the NVR in your router and use the public/WAN IP address to view it via Internet Explorer or Safari. At least the Trendnet IPView app is able to locate and access the cameras without too much typing on your part. And once programmed, the app does make it very easy to watch one, two, or four video feeds on one screen, and save stills or videos onto your smartphone. We should also mention the fan noise, because the NVR runs continuously and makes an audible and slightly annoying hum, even when not recording. The image quality is limited by the camera’s small sensor size and the NVR can only handle 720p resolution video anyway, so the TV-NVR104K was never going to win an Oscar for best picture. With the IR LEDs in action, it is good enough to capture usable video in both light and dark conditions, but in low light – and also when you zoom in – image quality takes a big hit. Using Ethernet cables instead of Wi-Fi might limit your installation options slightly, but it does make this system more reliable than the wireless alternative. The NVR recorded faultlessly onto its HDD during the test. That said, we had some problems linking the Trendnet IPView app and streaming video to a smartphone. More often than not, the connection dropped, or failed to record. But that perhaps says more about the nature of streaming video over Wi-Fi than this particular product. The TV-NVR104K makes multi-room surveillance both easy and affordable, and by including PoE and everything you need for installation, you can have it up and running in minutes. It’s not the most user-friendly interface, and image quality is limited to 720p, but for a four-channel indoor/outdoor solution, Trendnet gets the value to performance ratio about right.